(2011 Secret Santa) If it�s white, it�s snowing. It had been a bitterly cold winter�s day. Activity around the Holt had been limited the night before � few had gone out due to the temperatures. 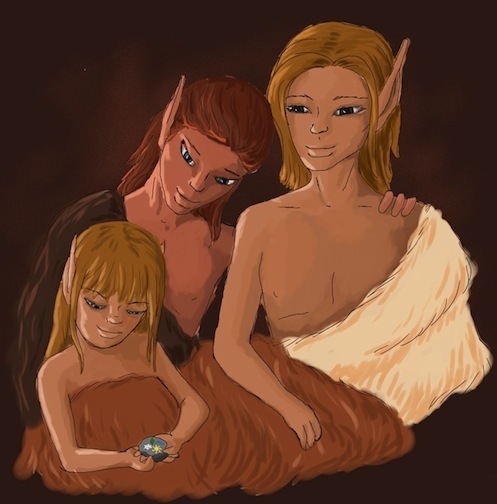 Many had taken to the Gathering Den to huddle together for warmth and comfort, including Thornbow and his family. Even with the mass of elves and wolves, the den was still cool � the wind whipped through the trees, and seemed to go right through the small entrance which Sunlight had shaped almost closed. Several leather hides had been stretched across it. Still, Thornbow found that when the wind whipped the right direction, a draft caused him to shiver and pull the furs closer around himself. He was certain that Sunlight would end up sealing the den on that side completely before the day was over. Trip shivered in his arms at the same point, and he pulled her closer. She snuggled into his arms a moment, then twisted around and looked at him. He had thought she was was asleep like the others in the den, but her wide, bright eyes indicated that she was a bundle of energy. �Will it snow soon?� the cub whispered. He laughed to himself. When the temperatures had dropped, she had talked non-stop about the previous winter, and how the two of them had spent so much time playing in the snow. Now that she was four turns old, she wanted to build a snow den, try ice-fishing, and wanted to swim at the hot springs. She also wanted to throw snowballs and make snow-elves. She had so many plans for the two of them. Thornbow tousled his sister�s hair and smiled at her. �I don�t know when it will snow,� he answered, his voice quiet. �Why not?� she asked innocently. She was disappointed, and his own heart ached for her � growing up was never easy. Having beliefs challenged and proved wrong was even harder. He hated that he was one of the first to disappoint her. **Why the long face? ** Windburn asked, picking his way over to the brother and sister. Trip looked up at her brother�s friend and shared, in sending, that she was disappointed her brother didn�t know as much as she had thought he did. **He knows more than he�s letting on, Trip! ** Windburn countered as he slid beneath the furs with the two of them. Thornbow looked at his closest friend. The redhead must have been having a hard time sleeping as well. Who could blame him? Thornbow thought the den was almost stuffy � this many elves and wolves, and only a small opening for fresh air. The warmth provided here was welcome, but it wasn�t the most comfortable set up for sleeping. **Send, Trip! ** Thornbow admonished, reminding her to be respectful of the others in the den, including their parents. The hope and pride in her mind-touch was sweet, Thornbow thought to himself. But he knew that he didn�t know everything. He wondered what Windburn would say. Trip�s eyes widened. Thornbow wondered where his friend was going with this. Thornbow couldn�t help but smile then. When Windburn was a cub, maybe a turn of the seasons older than Trip was now, the redhead had given his friend a painted rock. He had told Thornbow � Littlejab at that time � that it was a weather-rock. And he had told his friend how to use it. **You have a magic rock? ** Trip asked, amazed. Thornbow noticed Windburn�s questioning look, then nodded at Trip. **Can I see it? ** Trip asked, her mind-touch inquiring and excited. **frozen toes, nose, fingers, ears outside. warm, cozy, close to you and Windburn in here** he responded with a wolfish send. **Please? ** Trip repeated. �Please?� she whispered, her yellow-green eyes wide and pleading from where she sat in Windburn�s lap. **You don�t have to go outside,** Windburn reminded him oh-so-helpfully. **I know that,** he responded, grinning. **I just didn�t want you two to freeze when I took the covers off. ** That said, Thornbow stood, taking the furs with him. Windburn had been prepared for the squeal that came from Trip, and stifled it with his hand, holding her close, and reaching up to pull one of the furs back from Thornbow. **You don�t need all of them,** he accused. Thornbow flashed a grin at his friend and his sister, then picked his way through the den to the stairs that went upward through the Dentrees until he reached the third floor. He made his way to his den and found the small �weather-rock,� which he had kept through the years, then made his way back down to his sister and Windburn. The pair was snuggled tightly under the fur, and Trip smiled brightly when her brother returned. **You have it? ** she asked. Sitting on the floor next to Windburn, and settling the furs around them, he offered the small painted rock to his sister. **Here,** he said. **Oooh, pretty! ** she sent, taking it and clasping it to her breast. Then she held it back out and examined it more closely. **Leaf. Sun. Water. And a Snowflake! ** She grinned at Thornbow and Windburn. Easysinger�s son smiled. Thornbow knew his friend appreciated praise for his crafts. **How does it work? ** Trip then asked, interrupting her brother�s thoughts. **Can we take it now? ** Trip asked. Trip smiled at that. **How does it work? ** she asked again, persistent to know the answer to her question. **Then what? ** the cub asked. Trip was catching on. **If there�s ice, there�s frost? ** she asked. He couldn�t help but laugh at her enthusiasm. It was the same that Windburn had shown when telling his older friend about it so many seasons ago. **Can I have it? ** Trip interrupted.